Catalan Countries, Geographical distribution Northeast, around Barcelona; Catalonia, Valencia provinces, Balearic Islands; Carche region, Murcia Province in Spain. Catalan (; autonym: català or ) is a Romance language named for its origins in Catalonia, in what is northeastern Spain and adjoining parts of France. It is the national and only official language of Andorra, and a co-official language of the Spanish autonomous communities of Catalonia, the Balearic Islands, and the Valencian Community (where the language is known as Valencian, and there exist regional standards). It also has semi-official status in the city of Alghero on the Italian island of Sardinia. It is also spoken with no official recognition in parts of the Spanish autonomous communities of Aragon (La Franja) and Murcia (Carche), and in the historic French region of Roussillon/Northern Catalonia, roughly equivalent to the department of Pyrénées-Orientales. Catalan evolved from Vulgar Latin around the eastern Pyrenees in the 9th century. During the Low Middle Ages it saw a golden age as the literary and dominant language of the Crown of Aragon, and was widely used all over the Mediterranean. The union of Aragon with the other territories of Spain in 1479 marked the start of the decline of the language. In 1659 Spain ceded Northern Catalonia to France, and Catalan was banned in both states in the early 18th century. 19th-century Spain saw a Catalan literary revival, which culminated in the 1913 orthographic standardization, and the officialization of the language during the Second Spanish Republic (1931–39). 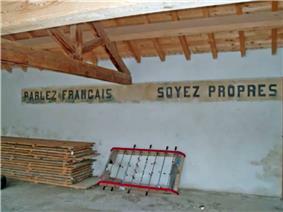 However, the Francoist dictatorship (1939–75) banned the language again. Since the Spanish transition to democracy (1975–1982), Catalan has been recognized as an official language, language of education, and language of mass media, all of which have contributed to its increased prestige. There is no parallel in Europe of such a large, bilingual, non-state speech community. Catalan dialects are relatively uniform, and are mutually intelligible. They are divided into two blocks, Eastern and Western, differing mostly in pronunciation. The terms "Catalan" and "Valencian" (respectively used in Catalonia and the Valencian Community) are two different names for the same language. There are two institutions regulating two standard varieties, the Institute of Catalan Studies in Catalonia and the Valencian Academy of the Language in Valencia. The two standards are based on the same orthographical norms and the differences are similar to those between British and American English. Catalan shares many traits with its neighboring Romance languages. However, despite being mostly situated in the Iberian Peninsula, Catalan differs more from Iberian Romance (such as Spanish and Portuguese) in terms of vocabulary, pronunciation, and grammar than from Gallo-Romance (Occitan, French, Gallo-Italic languages, etc.). These similarities are most notable with Occitan. Catalan has an inflectional grammar, with two genders (masculine, feminine), and two numbers (singular, plural). Pronouns are also inflected for case, animacy and politeness, and can be combined in very complex ways. Verbs are split in several paradigms and are inflected for person, number, tense, aspect, mood, and gender. In terms of pronunciation, Catalan has many words ending in a wide variety of consonants and some consonant clusters, in contrast with many other Romance languages. The word Catalan derives from the territory of Catalonia, itself of disputed etymology. The main theory suggests that Catalunya (Latin Gathia Launia) derives from the name Gothia or Gauthia ("Land of the Goths"), since the origins of the Catalan counts, lords and people were found in the March of Gothia, whence Gothland > Gothlandia > Gothalania > Catalonia theoretically derived. In English, the term referring to a person first appears in the mid 14th century as Catelaner, followed in the 15th century as Catellain (from French). It is first attested a language name by 1792. The term Catalonian is first attested in 1707. Catalan can be pronounced as , or . The endonym is pronounced /kə.təˈɫa/ in the Eastern Catalan dialects, and /ka.taˈɫa/ in the Western dialects. In the Valencian Community, the term valencià (/va.len.siˈa/) is frequently used instead. The names "Catalan" and "Valencian" are two names for the same language. See also status of Valencian below. With the union of the crowns of Castille and Aragon (1479), the use of Spanish gradually became more prestigious. Starting in the 16th century, Catalan literature experienced a decline, the language came under the influence of Spanish, and the urban and literary classes became bilingual. 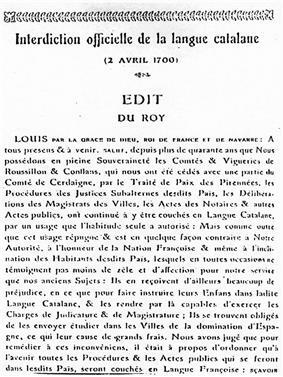 Shortly after the French Revolution (1789), the French First Republic prohibited official use of, and enacted discriminating policies against, the nonstandard languages of France (patois), such as Catalan, Alsatian, Breton, Occitan, Flemish, and Basque. Following the French capture of Algeria (1833), that region saw several waves of Catalan-speaking settlers. People from the Spanish Alacant province settled around Oran, whereas Algiers received immigration from Northern Catalonia and Minorca. Their speech was known as patuet. By 1911, the number of Catalan speakers was around 100,000. After the declaration of independence of Algeria in 1962, almost all the Catalan speakers fled to Northern Catalonia (as Pieds-Noirs) or Alacant. Nowadays, France only recognizes French as an official language. Nevertheless, on 10 December 2007, the General Council of the Pyrénées-Orientales officially recognized Catalan as one of the languages of the department and seeks to further promote it in public life and education. The decline of Catalan continued in the 16th and 17th centuries. The Catalan defeat in the War of Spanish Succession (1714) initiated a series of measures imposing the use of Spanish in legal documentation. In the 19th century, the region of Carche, in the province of Murcia was repopulated with Catalan speakers from the Land of Valencia. The Second Spanish Republic (1931–1939) saw a brief period of tolerance, with most restrictions against Catalan being lifted. Since the Spanish transition to democracy (1975–1982), Catalan has been institutionalizated as an official language, language of education, and language of mass media; all of which have contributed to its increased prestige. In Catalonia, there is no parallel of a large, bilingual, European, non-state speech community. The teaching of Catalan is mandatory in all schools, but it is possible to use Spanish for studying in the public education system of Catalonia in two situations, if the teacher assigned to a class chooses to use Spanish, or during the learning process of one or some recently arrived students. There is also some intergenerational shift towards Catalan. In Andorra, Catalan has always been the sole official language. Since the promulgation of the 1993 constitution, several Andorranization policies have been enforced, like Catalan medium education. On the other hand, there are several language shift processes currently taking place. In Northern Catalonia, Catalan has followed the same trend as the other minority languages of France, with most of its native speakers being 60 or older (as of 2004). Catalan is studied as a foreign language by 30% of the primary education students, and by 15% of the secondary. The cultural association La Bressola promotes a network of community-run schools engaged in Catalan language immersion programs. In the Alicante province Catalan is being replaced by Spanish, and in Alghero by Italian. There are also well ingrained diglossic attitudes against Catalan in the Valencian Community, Ibiza, and to a lesser extent, in the rest of the Balearic islands. Chart of Romance languages based on structural and comparative criteria (not on socio-functional ones). Koryakov (2001) includes Catalan in Occitano-Romance, distinct from Ibero-Romance. Catalan shares many traits with the other neighboring Romance languages (Italian, Sardinian, Occitan, and Spanish). 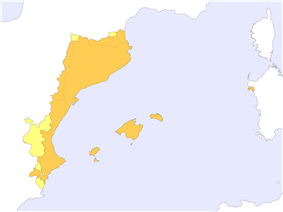 However, despite being mostly situated in the Iberian Peninsula, Catalan has marked differences with the Ibero-Romance group (Spanish and Portuguese) in terms of pronunciation, grammar, and especially vocabulary; showing instead its closest affinity with Occitan and to a lesser extent Gallo-Romance (French, Franco-Provençal, Gallo-Italian). 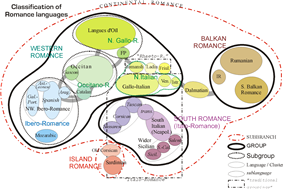 According to Ethnologue, the lexical similarity between Catalan and other Romance languages is: 87% with Italian; 85% with Portuguese; 80% with Spanish; 76% with Ladin; 75% with Sardinian; and 73% with Romanian. 17 cognates with Gallo-Romance, 5 isoglosses with Ibero-Romance, 3 isoglosses with Occitan, and 1 unique word. There is evidence that, at least from the a.d. 2nd century, the vocabulary and phonology of Roman Tarraconensis was different from the rest of Roman Hispania. Differentiation has arisen generally because Spanish, Asturian, and Galician-Portuguese share certain peripheral archaisms (Spanish hervir, Asturian/Portuguese ferver vs. Catalan bullir, Occitan bolir "to boil") and innovatory regionalisms (Sp novillo, Ast nuviellu vs. Cat torell, Oc taurèl "bullock"), while Catalan has a shared history with the Western Romance innovative core, especially Occitan. The Germanic superstrate has had different outcomes in Spanish and Catalan. For example, Catalan fang "mud" and ' "to roast", of Germanic origin, contrast with Spanish lodo and ', of Latin origin; whereas Catalan filosa "spinning wheel" and pols "temple", of Latin origin, contrast with Spanish rueca and sien, of Germanic origin. Situated between two large linguistic blocks (Ibero-Romance and Gallo-Romance), Catalan has many unique lexical choices, such as enyorar "to miss somebody", apaivagar "to calm down somebody", or rebutjar "reject". Balearic Islands Illes Balears Comprising the islands of Mallorca, Menorca, Eivissa and Formentera. Italy Alghero L'Alguer A city in the Province of Sassari, on the island of Sardinia, where the peculiar Alguerese dialect is spoken. These territories are sometimes referred to as the Països Catalans (Catalan Countries), a denomination based on cultural affinity and common heritage, that has also had a subsequent political interpretation but no official status. Various interpretations of the term may include some or all of these regions. Marked contrast of the vowel pairs /ɛ e/ and /ɔ o/, like in other Western Romance languages, except Spanish. Lack of nasalized vowels, unlike Portuguese or French. Lack of diphthongization of Latin short ĕ, ŏ, like in Galician and Portuguese, and unlike French, Spanish and Italian. Abundance of diphthongs containing /w/, like in Galician and Portuguese. In contrast with other Romance languages, Catalan has many monosyllabic words; and those ending in a wide variety consonants and some consonant clusters. Also, Catalan has final obstruent devoicing, thus featuring many couplets like amic "(male friend") vs. amiga ("female friend"). Central Catalan is considered the standard pronunciation of the language. The descriptions below are mostly for this variety. For the differences in pronunciation of the different dialects, see the section pronunciation of dialects in this article. The consonant system of Catalan is rather conservative, shared with most modern Western Romance languages. The distribution of the two rhotics /r/ and /ɾ/ closely parallels that of Spanish. Between vowels, the two contrast, but they are otherwise in complementary distribution: in the onset, [r] appears unless preceded by a consonant. Dialects vary in regards to rhotics in the coda with Western Catalan generally featuring [ɾ] and Central Catalan dialects featuring a weakly trilled [r] unless it precedes a vowel-initial word in the same prosodic unit, in which case [ɾ] appears. 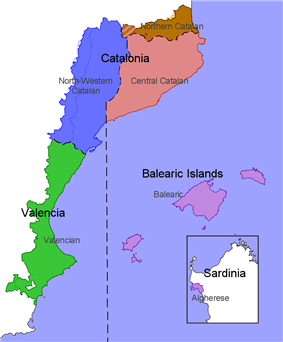 Western Catalan comprises the two dialects of Northwestern Catalan and Valencian; the Eastern block comprises four dialects: Central Catalan, Balearic, Rossellonese, and Alguerese. Each dialect can be further subdivided in several subdialects. Central, Western, and Balearic differ in the lexical incidence of stressed /e/ and /ɛ/. Usually, words with /ɛ/ in Central Catalan correspond to /ə/ in Balearic and /e/ in Western Catalan. Words with /e/ in Balearic almost always have /e/ in Central and Western Catalan as well. As a result, Central Catalan has a much higher incidence of /e/. In verbs, 1st person present indicative desinence is -e (∅ in verbs of the 2nd and 3rd conjugation), or -o.
E.g. parle, tem, sent (Valencian); parlo, temo, sento (Northwestern). In verbs, 1st person present indicative desinence is -o, -i or ∅ in all conjugations. E.g. parlo (Central), parl (Balearic), parli (Northern), ('I speak'). E.g. hòmens 'men', jóvens 'youth'. In nouns and adjectives, loss of /n/ of medieval plurals in proparoxytone words. Standard Catalan, virtually accepted by all speakers, is mostly based on Eastern Catalan, which is the most widely used dialect. Nevertheless, the standards of Valencia and the Balearics admit alternative forms, mostly traditional ones, which are not current in eastern Catalonia. The most notable difference between both standards is some tonic ⟨e⟩ accentuation, for instance: francès, anglès (IEC) – francés, anglés (AVL). Nevertheless, AVL's standard keeps the grave accent ⟨è⟩, without pronouncing this ⟨e⟩ as /ɛ/, in some words like: què ('what'), or València. Other divergences include the use of ⟨tl⟩ (AVL) in some words instead of ⟨tll⟩ like in ametla/ametlla ('almond'), espatla/espatlla ('back'), the use of elided demonstratives (este 'this', eixe 'that') in the same level as reinforced ones (aquest, aqueix) or the use of many verbal forms common in Valencian, and some of these common in the rest of Western Catalan too, like subjunctive mood or inchoative conjugation in -ix- at the same level as -eix- or the priority use of -e morpheme in 1st person singular in present indicative (-ar verbs): jo compre instead of jo compro ('I buy'). In the Balearic Islands, IEC's standard is used but adapted for the Balearic dialect by the University of the Balearic Islands's philological section. In this way, for instance, IEC says it is correct writing cantam as much as cantem ('we sing') but the University says that the priority form in the Balearic Islands must be "cantam" in all fields. Another feature of the Balearic standard is the non-ending in the 1st person singular present indicative: jo compr ('I buy'), jo tem ('I fear'), jo dorm ('I sleep'). In 2011, the Aragonese government passed a decree for the establishment of a new language regulator of Catalan in La Franja (the so-called Catalan-speaking areas of Aragon). The new entity, designated as Acadèmia Aragonesa del Català, shall allow a facultative education in Catalan and a standardization of the Catalan language in La Franja. 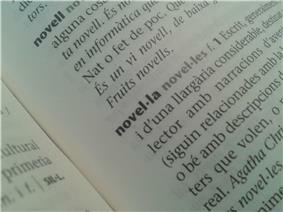 Literary Catalan allows the use of words from different dialects, except those of very restricted use. However, from the 19th century onwards, there is a tendency of favoring words of Northern dialects in detriment of others, even though nowadays there is a greater freedom of choice. Like other languages, Catalan has a large list of learned words from Greek and Latin. This process started very early, and one can find such examples in Ramon Llull's work. On the fourteenth and fifteenth centuries Catalan had a number of Greco-Latin learned words much superior to other Romance languages, as it can be attested for example in Roís de Corella's writings. The process of morphological derivation in Catalan follows the same principles as the other Romance languages, where agglutination is common. Many times, several affixes are appended to a preexisting lexeme, and some sound alternations can occur, for example elèctric [ə'lɛktrik] ("electrical") vs. electricitat [ələktrisi'tat]. Prefixes are usually appended to verbs, for as in preveure ("foresee"). There is greater regularity in the process of word-compounding, where one can find compounded words as much as in English. Catalan uses the Roman alphabet, with some added symbols and digraphs. The Catalan orthography is systematic and largely phonologically based. /kw/ before other vowels quatre ['kwatrə] ("four"). Intervocallic s is pronounced /z/ grossa ['gɾɔsə] ("big-feminine)"
[ddʒ] fetge ['feddʒə] ("liver"), mitjó [mid'dʒo] ("sock"). The morphology of Catalan personal pronouns is complex, specially in unstressed forms, which are numerous (13 distinct forms, compared to 11 in Spanish or 9 in Italian). Features include the gender-neutral ho and the great degree of freedom when combining different unstressed pronouns (65 combinations). The grammar of Catalan follows the general pattern of Western Romance languages. The primary word order is SVO (subject–verb–object). aubergine albergínia "aubergine" / "eggplant" Through French. barracks barraca "improvised hut" Through French baraque. barracoon barracó or barracot "improvised hut" Through Spanish barracón. paella paella "small cooking pot" Through Old French paele, ultimately from Latin patella (small dish). cul-de-sac cul-de-sac "with no exit" Word shared with French and Occitan. cucumber cogombre "fruit used in salads" Through Old French cocombre, word shared with Occitan. ^ a b Some Iberian scholars may alternatively classify Catalan as Ibero-Romance/East Iberian. ^ a b c d e f g h i j k l Wheeler 2005, p. 1. ^ a b c d e f g h i j k l m n o p q Costa Carreras Yates, pp. 6–7. ^ a b c d e Wheeler 2010, p. 190–191. ^ a b c d e f g Wheeler 2003, p. 207. ^ a b c d e f g h Moll 1958, p. 47. ^ a b c d Enciclopèdia Catalana, pp. 634–635. ^ a b Costa Carreras & Yates 2009, p. 5. ^ a b c d e f g h i j k l Feldhausen 2010, p. 5. ^ "Dictamen de l'Acadèmia Valenciana de la Llengua sobre els principis i criteris per a la defensa de la denominació i l'entitat del valencià". Report from Acadèmia Valenciana de la Llengua about denomination and identity of Valencian. ^ a b Marc Howard Ross, Cultural Contestation in Ethnic Conflict, page 139. Cambridge University Press, 2007. ^ a b c Jud 1925. ^ a b c Colón 1993, pp. 33–35. ^ a b c d e f g h i j k l m n o p q r Enciclopèdia Catalana, p. 632. ^ a b c d e f g Feldhausen 2010, p. 4. ^ a b c d e f g Schlösser 2005, p. 60f. ^ a b c d e f g h i j k l m n o p Enciclopèdia Catalana, p. 630. 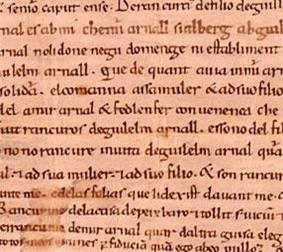 ^ a b "Dictamen de l'Acadèmia Valenciana de la Llengua sobre els principis i criteris per a la defensa de la denominació i l'entitat del valencià". Report from Acadèmia Valenciana de la Llengua about denomination and identity of Valencian. ^ Modern Spanish also has gris, but it is a modern borrowing from Occitan. The original word was pardo, which stands for "reddish, yellow-orange, medium-dark and of moderate to weak saturation. It also can mean ochre, pale ochre, dark ohre, brownish, tan, greyish, grey, desaturated, dirty, dark, or opaque." Northern Catalonia: Media Pluriel Survey commissioned by Prefecture of Languedoc-Roussillon Region done in October 1997 and published in January 1998 . ^ a b Wheeler 2005, pp. 37,53–54. ^ Carbonell & Llisterri 1992, p. 53. ^ . 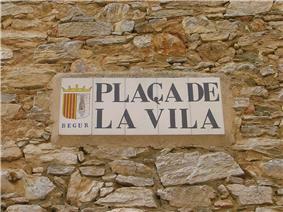 Here Recasens labels these Catalan sounds as "laminoalveolars palatalitzades"
^ . Here the authors label these Catalan sounds as "laminal postalveolar"
^ Recasens & Espinosa 2007, pp. 145. ^ See for more information. Spanish from Extremadura or Castúo, etc.